RUSSIAN scientists have admitted that they are training monkeys for an ambitious mission to Mars – and it leaves in just two years. The space race to Mars is beginning to heat up as Russians look set to beat the US as the first country to set foot on the red planet.However, the foot might be that of a macaque, if all goes according to plan. The Russian-trained rhesus macaques could be the first life to set foot on Mars as countries around the world compete to reach the mysterious planet first.The news is just the latest sign that the old Cold War foe is ramping up its efforts to edge ahead in this century’s new space race. 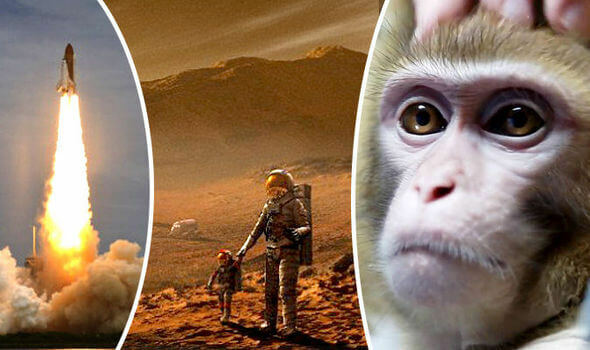 Monkeys were key to paving the way in the race to moon and now the Russians could bring them one step closer to a human colony on Mars.Experts at the Russian Academy Of Science in Moscow are preparing the four rhesus macaques to make the flight in two years. The animals are being trained for three hours a day so they can travel safely into space by themselves and eventually land on the Red Planet by 2017. The little creatures are mastering the use of a joystick, as well as solving maths tasks and puzzles.When they complete the task successfully they are rewarded with a sip of juice. At the end of their training the monkeys should be capable of completing a daily schedule of tasks on their own. The group of macaques, which were hand-reared on special farms, were specially chosen for their cognitive abilities and their quick-learning skills.Macaques typically have a lifespan of around 25 years, so it is hoped there is enough time to train them properly and for them to survive the six-month trip to Mars. The scientists even hope the monkeys themselves could teach others macaques the skills needed to fly the mission. NASA are hoping to reach Mars by the 2030s while China is also setting out an ambitious project to be the first to land on Mars.